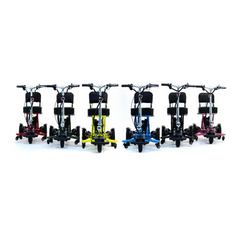 This Transformer series is an easy to use, ultra-portable electric, mobility scooter offers the ultimate in convenience offering both Remote Control and Manual folding operation. While light weight, 53 lbs (24 kg), this remarkable, compact scooter has a 300 (136 kg) weight capacity…that weight includes the 3lbs (1.36 kg) Lithium battery, which gives you up to 13.5 miles on a single charge! The Transformer folds into a VERY compact and easy to manage unit that easily fits into the back of the smallest hatchback.This unique scooter is not only extremely portable and convenient but it’s also VERY Comfortable and easy to use. Its small compact folded size makes it easy to travel with whether by car, boat, train or airline…It’s “Airline friendly” and fully compliant with airline regulations for the carriage of Lithium Ion dry cell batteries.